We are pleased to announce that we will be hosting the 1st Anniversary of SG Drum Academy on the 22nd of July at Riverwalk. 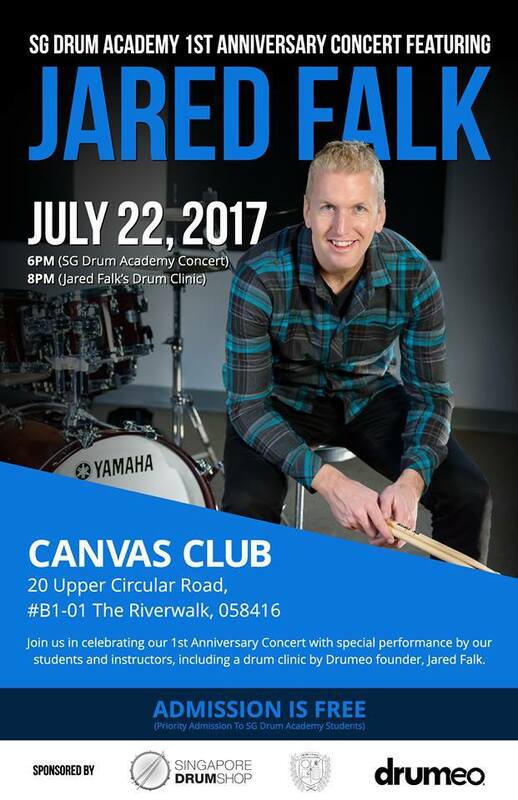 There will be performances from SGDA's students and teachers and of course, a drum clinic featuring Jared Falk. ​No registration is required for attending this event. We will be offering limited slots of Private Lessons and Masterclasses with Jared Falk. Masterclass : $70 per pax, held on the 22nd July from 1200-1315pm with Jared Falk. A small intimate Masterclass of up to 10 drummers. Comes with a free 1 month Drumeo Edge Coupon worth $50. Private Lesson : $150 per pax, held on the 23rd July. A 45 mins 1 to 1 lesson with Jared Falk. Email us at the contact form if you wish to sign up for Masterclass/Private Lesson.